Ziplining is a unique and memorable way to experience Hawaiʻi. Strap yourself in for a ride over lush tropical terrain. Reinforced cables run through forest canopies creating a path for harnessed riders to experience the sights, sounds and scents of a Hawaiian rainforest. 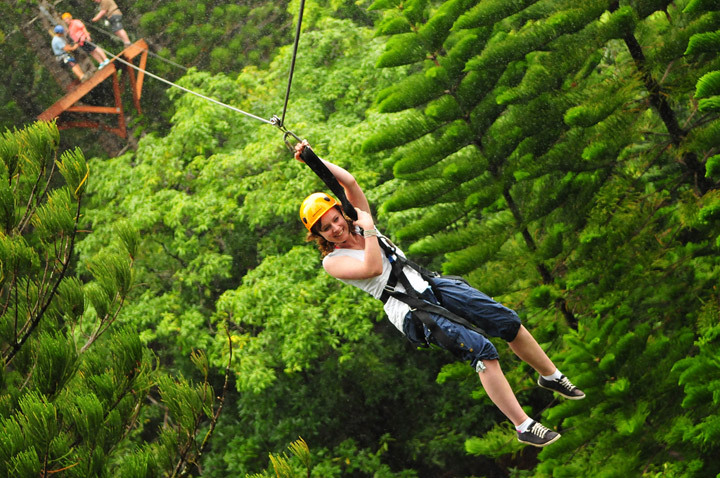 Ziplining tours operate on Oʻahu, Maui, Big Island and Kauaʻi. There are several to choose from and most include much more than ziplining, like garden walks, swimming in rivers, and sky bridges (see our list of the best zipline tours in Hawaii). You can expect to pay at least $100 per person, depending on the length of the tour and what is offered. In most cases, there are free activities on the grounds for non-participating family and friends. A lot of these ziplining tour companies also offer pick-up and drop-off services. Be sure to shop around and inquire about additional services or other activities to do in the area. Though ziplining may seem a bit scary, it’s not! Ziplines don’t give you the same stomach-dropping feeling you experience on roller coasters. The motion is a gentle lateral movement, nothing erratic. People with moderate fears of heights and motion sickness have been able to take a zipline tour comfortably. Plus, safety standards are high industry-wide. Children as young as 4 years old can zip. This is based on weight requirements, which can range from 35 to 275 lbs. with participants being weighed at check-in. Zip tours have varying age and weight requirements, so be sure to double check the tour you are booking. Young children are required to ride with an adult and tandem zip lines are available through some companies. Participants should be in moderately good health. Pregnant women, people with existing or recurring injuries, and those with serious physical or mental disorders are discouraged from, and may not be allowed to, participate. The ziplining tours themselves usually last an hour and a half to three hours, depending on the tour. Wear shoes, sunscreen and comfortable clothing.